First of all, hello there. Since I started playing this game it gave me a Shadowrun vibe, so the purpose of this mod is the add extraordinary (and fun) things, like Magic and advanced Technology. · Magic isn't omnipotent, you can't ignite water. But you can freeze water. Magic is also tiring, overuse it and you will suffer the consequences. · Magic becomes available through the skill [Awakened]. Certain encounters can change how you magic work; i.e. If you make a pact with a Demon for Blood Magic knowledge, the [Awakened] skill will be removed and a different skill, in this case [Blood Magic] will be added in its place, unlocking new recipes and battle moves (and maybe blocking others). · Cybertechnology is certainly powerful, but most of it requires electricity. To craft Cyber item you will need a (craftable) Advanced Workbench and Cybertechnologic tools (craftable with the help of an Advanced Workbench). · Cyber items are very diverse, from Vibroswords to Whip-swords and to Nightvision glasses that can shoot a laser. · Most ingredients needed are going to be sold at Detroit Mega city, but some can be crafted and/or found while scavenging. · Nothing of it is coded. - Can kill the Dogman with the use of the skill [Awakened]. 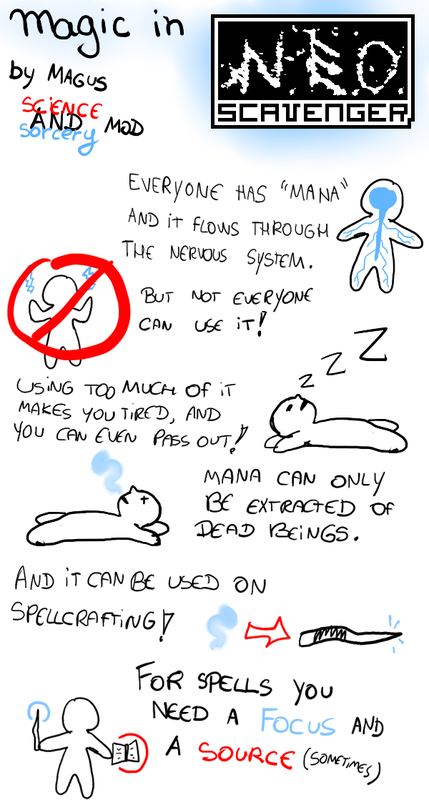 - Can use Mana as charges for [Awakened] weapons and stuff. 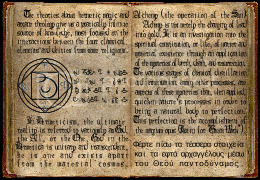 - Can find a very special item, the Weird Tome, when scavenging the Cryo Facility with the use of the skill [Awakened]. The Weird Tome produces Mana. - Can craft a Wooden Wand with the use of the skill [Awakened], Sharp Edge, Medium Branch, Medium Thread and Rags. It's "ammo" is Mana. - Can use the Wooden Wand during scavenging when the mode "Summon Light" is activated, while holding it in this mode it can also be used as a weaker Flashlight. To "turn off", select the "Dispel Light". Every time it is used during scavenging consumes 1 Mana. - Can craft a Mana Bottle with the use of the skill [Awakened], Medium Branch and a Glass Bottle. It can carry Mana. - Can use Combat Magic during combat while both the Weird Tome and Wooden Wand are equipped. - Combat Magic currently has three spells: Mana Bolt, Mana Ball and Mana Wave. They can be used during the Prepare Spell mode that can be accessed with the combat move of the same name. To stop, use the Cancel Spell. - Mana Bolt is a single projectile that never misses, but consumes 2 Mana. - Mana Ball works like 3 Mana Bolts, but consumes 4 Mana. - Mana Wave works like Mana Bolt, and can knock the enemy down, but consumes 3 Mana. - Combat Magic consumes a fair amount of stamina. Using it carelessly makes your character tired. The Science&Sorcery Mod deal with nanobots. travel to the astral realm. sounds cool, i would make a list of everything you "want' to do and run it by kaaven to make sure it can be done before you start. are you an artist by chance? I believe there won't be any problems (most of the mod will be combat moves, two skills, some negative traits and items), but I guess you're right. Thank you for the offer but no. :) Well, not right now. The Anodynic glow looks pretty awesome. And Shadowrun is awesome. So I guess it goes without saying that a Shadowrun-esk mod will be awesome. Cannot wait to duel with an Ogre biker-shaman ! You just made me wish I could "like" that post. so maybe 2-4 weeks before we see this out of alpha? I don't know, let's see. I want to make some more sprites first. Anodyne coding is completed and it's description in the OP was updated. I'm so hyped for this, This looks great. Then just wait a little, I am tweaking some things then I'll release a v0.1a. Some updates about the mod. Things were changed and the mod is being rewritten now that I know (kind of) how to do things. Good to see you still working on it. This truly looks like it's shaping up to be an epic mod. Normally, something this outlandish would seem to be very out of character, but in the world of NeoScavenger, it makes sense. I would give the opinion that there should be more Native American influence. You seem to be taking the inspiration here from a more European Thaumatalogical place, instead of the lore of the Native Americans and Michiganders. What we know of the world, already, is that things which people believe come true. This is saying there are a lot of Golden Dawn/Alister Crowley types out there who believe in magic and that it works in this fashion... which is fine, certainly one cannot ignore the possibility that there is quite a lot of belief in that type of magic. But what of the Anishinaabeg? They have the Nooke Doodem, the medicine men. Their magic would be more totem and spirit based. They could share the astral projection power, but would likely call it Walking With Spirits or something of the like. Thing is, if you're going from a Tech meets Magic world feel, it would be a shame to overlook the magic already present. Also, if you're going for a Shadowrun feel (which it really seems you are, given Awakened and Cybertechnology), they have this same division between magics, with Shamans, Mages, and Blood Magic. Or at least they did back in 3rd edition, before they redesigned it for the new edition that nobody plays. So you start with Awakened, and you can have encounters. In one there's a demon that can teach you BM, in one you can do a pact with a Spirit teaching you Shamanic Magic and the last one is not really planned but probably something about delving even more into the Arcane instead of learning something else. I'm also thinking to make Spirits and Demons kind of "Merga-like", with weird shapes and glowing orbs of doom or love or whatever. If you need ideas on the spirit types, check out that "primer" I linked. They have a list of the kinds of manidoog (spirital beings) that the Ojibwe speak of in the Aadizookaan. And belief is the most important part here, and presumably these stories are still being passed down. The Agwajiwininiwag are particularly interesting. Oh, and please don't forget the focus on Asemaa (tobacco). It is the most powerful of medicines to the Anishinaabeg. Adding some Lovecraftian inspirations is brilliant, especially considering the whole "belief equals existence" angle, here. There are more than a few people who believe in the Necronomicon being a real magical treatise, instead of the pulp fiction novel it was actually written as. So, I was thinking, since I'm going to add spellbooks (books that add new combat moves), I'm going to rework shamanism a little. Let me hear your opinion. [Awakened] - Can use magic. Demon encounter replaces it with [Blood Magic] - Can use blood magic spells. Necronomicon - Unlocks a set of Lovecraftian spells; more focused on the "Pact with a Demon" side of BM. Liber Mortuorum - Unlocks a set of Necromantic/Heretic spells, more focused on the "Death magic" side of BM. Spiritual Enlightenment replaces it with [Spirit Mage] - Can use "support" spells. Biblia Sacra Vulgata - Unlocks "Catholic" magic, more focused on the "healing and blessing" aspect of SM. And then there's a third encounter, but I don't know what I should do about it yet. Really, I don't know if you need a third option. Those already cover the basics, right there. I would recommend to stick closer to the source material for the Shamanic magic, particularly by calling it something more lore correct (that's a minor thing with a huge impact). The Midewiwin (also spelled Midewin and Medewiwin) is the Grand Medicine Society of the indigenous groups of the Maritimes, New England and Great Lakes regions in North America. Its practitioners are called Midew and the practices of Midewiwin referred to as the Mide. The Midewiwin society is a secretive animistic religion, requiring an initiation, and then progressing to four levels of practitioners, called "degrees". Occasionally, male Midew are called Midewinini, which sometimes is translated into English as either "shaman" or "medicine man". The Waabanowin (also spelled Wabunowin, Wabunohwin and Wabunohiwin) is the Dawn Society, also sometime improperly called the "Magical Dawn Society". Its practitioners are called Waabanow and the practices of Waabanowin referred to as the Waabano. The Waabanowin are distinct society of visionaries. Like the Midewiwin, the Waabanowin is a secretive animistic religion, requiring an initiation. But unlike the Mide, the Waabano have sometimes 2 levels and sometimes 4. This variation being dependent on the particular lodge. They were systematically imprisoned in mental hospitals by the United States government in the late 19th century and early 20th century. Because of this persecution the Waabanowin went underground and have just begun to reemerge since the passage of the American Indian Religious Freedom Act. While many of the ceremonies and traditions are closely guarded, one that is known is the Fire Dance. The Waubunowin have been coming out from underground and re-establishing themselves for about 15 years now. There are active lodges currently in Saskatchewan, Ontario, Quebec, Indiana and Michigan. Another well-known society among the Anishinaabeg is the Jiisakiiwin, also known as the Shaking Tent or the Juggler's Tent. Among the Anishinaabeg, a particularly powerful and well-respected spiritual leader who had trained from childhood is called a Jaasakiid or Jiisakiiwinini, also known as a "Juggler" or "Shaking-tent Seer." In the past they were hunted down and murdered by both Canadian and United States officials as being "individuals who endanger society". Of these types of "magician", it would seem the Mediwiwin is the most grounded and normal type, the Wabunowin is more mystical, and the Jiisakiiwin is more threatening to the White Man. Just because a spirit has come to you, that does not mean the spirit is a good one. They may be a trickster, but also a central hero figure to the culture, such as Nanabozho. Or they might be a Wiindigo, and the outcome may not be pretty for the player. "In the time of the Seventh Fire New People will emerge. They will retrace their steps to find what was left by the trail. Their steps will take them to the Elders who they will ask to guide them on their journey. But many of the Elders will have fallen asleep. They will awaken to this new time with nothing to offer. Some of the Elders will be silent because no one will ask anything of them. The New People will have to be careful in how they approach the Elders. The task of the New People will not be easy. If the New People will remain strong in their quest the Water Drum of the Midewiwin Lodge will again sound its voice. There will be a rebirth of the Anishinaabe Nation and a rekindling of old flames. The Sacred Fire will again be lit. It is this time that the light skinned race will be given a choice between two roads. If they choose the right road, then the Seventh Fire will light the Eighth and final Fire, an eternal fire of peace, love brotherhood and sisterhood. If the light skinned race makes the wrong choice of the roads, then the destruction which they brought with them in coming to this country will come back at them and cause much suffering and death to all the Earth's people." And I really do like the idea of Catholic magic, as well. In the name of Jesus Christ, I rebuke thee, agent of Satan! Begone! Don't make them too focused on healing and blessing. There is also Exorcism and the like in that vein of Christianity. Also invocation of the Saints for various boons (such as Saint Anthony, patron saint of lost items). Basically, if you scratch the skin of the idea of a Catholic Priest with actual Magical Powers, you come up with something a lot like a D&D Cleric, just giving praise to The Mother, The Father, and The Holy Spirit instead of Helm or whatnot. Actually, the Holy trinity is "The Son, The Father and The Holy Spirit". Okay, true enough, but you get what I mean. Actually, with Christianity's views on magic in general, it might be more prudent and realistic to make the Catholic Magic focus mainly on protection and the banishment of evil spirits. Sort of like an Anti-Shaman, if you will. I like the general idea, but some of the naming is actually a bit... off. The necromantic magic is OK, kind of a standard really, I would not call it "heretic" though. Cause it is heretic from what? Heretic is someone who challenges the teachings of an officially established belief. In this world, someone who rejects/challenges the popular belief is, actually, the only person without any real power :D So that name, does not fit at all. So maybe the Egyptian book of the dead ("rw nw prt m hrw" :D). Or simply stick to the "Libris Mortis", which is a made up "Book of the Undead" from the DnD role-playing game. Necronomicon is fictiona, so this one can be too, after all. The Shamanistic magic is also OK, but I must say it does not really fit, at least in my mind, to be able to learn it from a book. That seems like a thing one would need to learn from another shaman. And if you would like to depict how the real-world shamans work, an item one would have to "have on them" in order to practice, would be something that would help him reach a trance in which he can communicate with the spirit world. Iconically, it is a drum they beat to slowly bring themselves into the trance-like state. The "catholic" magic is the one I feel has the worse naming. For one, naming it after one religion (and actually only one branch of one religion) suggests that all the others don't have the power that this one does (which would actually suggest that this is the "right" one). And even if you would like to stick with that, what you describe is still more like "White Magic", which was distinct from the actual religious practices, historically. Plus, making a common Bible the necessary "special" book is weird - it is the most often printed book in the history and, statistically, one should be able to find one in one in five, maybe ten, houses. Not too special, really. Plus, the Bible isn't really a ritual book, so even in therms of it being utilized that way, it wouldn't be really useful. I know that, but that's because it's not copy-paste. Since "Belief equals power", and if you character believes that the Necronomicon allows him to summon otherworldly beings into unwilling beings and what not, he will be able to do this. A section that mentions creatures beyond the threshold of space such as the Tomb Herd. A description of the powers the Other Name of Azathoth gives the wielder (but not the name itself). Information on the Gulf of S'glhuo. A chapter on a complicated and lengthy process capable of resurrecting the dead. A formula for temporarily banishing manifestations of Ahtu. Page 984 contains a passage in the Naacal, no translation is given. The Zoan Chant; a spell for reflected harmful powers sent against the caster. A formula for Mind Transference. Instructions on how to make the Powder of Ibn Ghazi. A foot note containing an untitled formula capable of opening a gateway to Cthugha. A passage about the Crawling Ones and the Green Flame Tulzscha. Page 751 contains a long chant capable of summoning Yog-Sothoth if used at the right time. Information on the Black Pharaoh Nephren-Ka. A large amount of information on the Antarctic Elder Things. Information on an ancient aquatic race Alhazred terms the Dwellers in the Depths. This page also features an astrological chart. Page 224 contains the Hoy-Dhin Chant. Instructions on how to destroy an egg of Yig using a combination of musical notes. An illustration of the Furnace of Nug. A prophecy foretelling the rebirth of the high priest Nophru Ka. A chapter on Umr-At-Tawil and the ultimate gate. Yeah, "Heretic" is kinda off. I was going to use Liber Mortis, but the I think that Liber Mortuorum sounds better. Well, maybe not... The egyptian one sounds nice, I'll see about it. It's not a "book", it's a journal, or a diary that's passed from elder to elder. Since everything bad that could happen actually happened in Neo Scavenger, I believe that native tribes would be even more careful about preserving their beliefs, rather than losing them forever. Well, the Bible is a very old and popular book, and couple this with the fact that "Belief equals power", and you get "magic". Also, catholic mages are a thing in the Shadowrun universe. Plus I really like the idea of Catholic-based magic. Have you ever played the old-school game "Inquisitor"? In the game you can be a "Thief", a "Paladin" and a "Priest". I'm with you on the Catholic Magic being a thing. Of all the Christian religions, Catholicism is the one most steeped in tradition and iconography, and therefore is the most suited for becomming an empowered tradition due to beliefs. One could make the same argument for Easterrn Orthodox churches, but they likely do not have the critical mass required to have their beliefs become manifest in Michigan. But I would also say that they should not be a White Mage clone. The Anishinaabe Midewinini are already focused on healing, so much so that their name for themselves translates very well to "Medicine Man" (Actually Heart/Spirit Worker). By contrast, the very nature of the Catholic Church, their stance on magic and its practitioners, and the focus on using prayer and belief for protection from evil lends toward them being more adequately compared to a D&D Abjurer, focused on protective magics and spirit banishment. Sublimation into or Conquering over that Power - Do you accept it into your very being? Or fight against it to retain your humanity? Sublimation into the Arcane power would lead to Blood Magic. Conquering it would lead becoming a Mage. Sublimation into the Spirit would lead to becoming a Midewinini. Conquering it would lead to Catholic Magic. Also, just as a thought, it would be nice to have some medallions for this power. Icons, if you will. A Cross which can be used as a spiritual weapon against evil, or a wand with which to cast spells. So, to use magic battle moves you would need a Source of Knowledge and a Magic Focus (Wands, staves, religious icons, spiritual instruments, etc; that may or may not be used as weapon). A character start with [Awakened], that is pretty much a temporary skill, that can become [Hermetic Mage] (common vulgar magic and non-religious ritualistic magic), [Blood Mage] (anything that is bad or evil) or [Spirit Mage] (Spiritual magic, religious or not, powered by faith or not). By searching the cryo lab with it you would find a "Blank tome" (Probably dropped by the cloaked thing). Having this skill makes the magic encounters available, I want to have more than one way to get the same skill, because of roleplaying and stuff. - If you accept his offer you get [Blood Mage] and some special pages that can be combined with the Tome to craft a Necronomicon. Sacrificing someone is not cool, so maybe there should be a drawback for that. (Is it possible to increase the aggressiveness of a faction? Maybe blue frogs disliking you). - You can also search for help in the Astral plane, would find a Anishinabe elder that sensed something strange in the region, you agree to help him but he gets badly injured while banishing the "Evil spirit", he offers you his tattered journal where he kept all his knowledge because of his bad memory. You can accept his offer and get [Spirit mage] or bury him and go away. The kid gets possessed in the fight and dies too, the world is not good. You can combine his journal with the tome to make it more resistant, creating the "Elder's Journal"
- Or you can fight the demon with your own power (Banish it, maybe kill it, but I'm not sure if a Phillips would be able to kill something like that) and save the kid. This ends the encounter. Other encounter would be finding a hex where there are ghosts haunting someone in place. They were murdered, but refused the eternal peace because they wanted revenge, becoming vengeful spirits. - You can try to talk to them, and they mutter something about revenge and offer you knowledge over the dead. If you help them with their revenge (helping them ends the encounter but in two~three turns you find the murderer that killed them, and then you will have to kill him) you get [Blood Mage] and weird pages that can be used to craft the tome of necromancy. - And you can turn away, messing with the spirits is bad. This adds the possibility of adding more kinds of magic by using the three skills, if one day I want to add Wiccan magic, or Taoism, it won't be hard to do. I like the concept, a lot. Starting as Awakened but uninitiated makes a lot of sense, as Phillip has just woken up from Cryo Sleep, unaware of the coming of magic. He certainly has some background knowledge, having done studies on cryptozoology and fantasmology for the New Earth Ostracon website. Unfortunately, he has amnesia, so any actual working knowledge of this is lost, but he could still have the "spark"
It's always best to keep ones options open, and make a framework rather than hardcoding how something works. It makes things easier to add on later, yes, but also forces you into a more modular and unified way of thinking which makes the initial creation that much easier. Just remember whenever you're making something for the mod, wondering "what if I wanted to do this differently later on, could I?". That will prevent you from coding yourself into any corners. I am super excited to see what you do with this mod. Anyway, what do you think of this "Reading book encounter" image? That's beautiful! Just the right amount of diagrams and a hint of Arcane Words of Power in different languages. Yes, I know. I'm planning different combat styles for different "types of mages"
ie an Awakened mage must hold the tome and a magic focus (want, staff, etc), that enables the combat move "Start Incantation/Chanting/whatever), that gives a condition that blocks normal combat moves and enable spells, after you use a spell the condition goes away, that way a powerful spell can take more than one turn to be done and things like that. Your mod is different from any other I have tried to download. It would be great if you could add a short instructions section with the download. My computer also is lacking the program you used to wright the mod, if there is a similar program we could use that is free that would be great. This is an awesome mod! I like it quite a lot. I think the addition of magic is great, and fits well in the setting. I was wondering, though, if you could release a few 'compatibility patches' for some of the bigger mods, like NeoScavExtended and Might Mod of Doom. I'd love to be able to play with one of those two mods AND yours. That is quite understandable. I imagine compatibility mods are indeed tiresome to make, so no worries! And thanks for replying so quickly I'd offer to do a compatibility mod, but I know NOTHING about modding, so... Yeah, I can't do that. Haha. But keep up the good work! Also, could I suggest you add an extra flaw or two? That way, we'd be able to pick more traits and whatnot, including Awakened. Flaws are a good idea, but for now blocking a skill with a flaw is impossible, so some of the flaws I want to create are impossible. Despite this, I still have one or two in the makings. Check the original post for more information. It's kind of on a hiatus because I got a graphics tablet and was learning how to use it. But if I start to code things I again right now I could release a new update in one hour. I'm a huge Shadowrun fan so I'm very interested in this mod. Do you know if it's compatible with NSE? That would be nice, also, I'm always open to suggestions. How do I get mana? how is the mod progressing? that's quite cool but would you be able to summon thing, like say a shifter in rifts. me "i killed a dogman with bear hands"